Resaleworld has been a long-standing partner with the world’s largest marketplace, eBay. 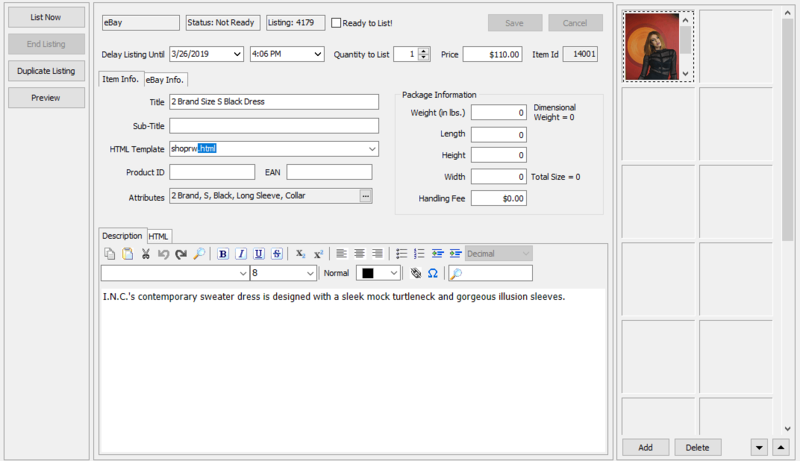 With the Liberty software, you can directly connect your inventory items to an eBay storefront. Add photos, create your eBay settings, payment, and shipping policies, or customize your Auction Template all within the Liberty software! The eBay integration is offered as a monthly stand-alone service or included with our ShopRW hosted website plans (Plan B or Plan C). This service is also now included with our new Shopify integration service. Choose a listing duration, set an auction starting price and select which payment types you currently accept. You can also promote your listings by choosing enhanced selling features such as Boldface Title, Featured Plus, Buy it Now and Featured Gallery. Specify any accepted listing duration, enter your starting price, select what accepted payment types. Save time by adding default content to your auction templates by specifying your payment and shipping policies, add a welcoming header or describe your refund and return policies within your template’s footer section. Images on eBay ads can be displayed at different sizes for better formatting.